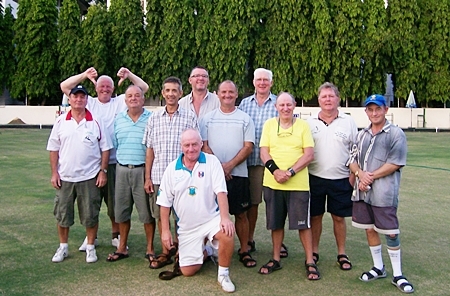 Saturday 25th Feb, there was a special match played between The Bowling Green Lawn Bowls members and The Bunker Boys Golf Society, who are based at the Bowling Green now that the Bunker Bar has been sold. Half of the Bunker Boys had never played bowls before, but were given tuition before the match by a few of the lads from the Bowling Green. The Bunker boys were given a 7 shot start in each match as a handicap and there was a total of 10 matches played, each match being played over 10 ends. The Bunker Boys (and girls) Golf Society team. The Captain of the Bunker Boys was William Macey (a prominent P.S.C. 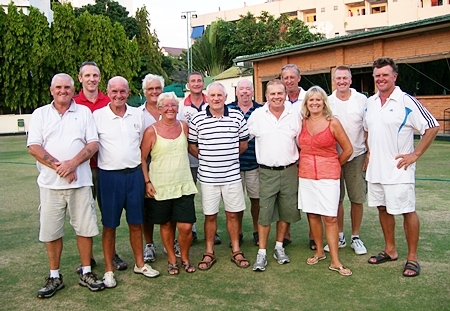 Committee member), with ‘Brummie’ John captaining The Bowling Green. All the matches were played in a fantastic spirit with both teams desperately wanting to win. It seems that The Bunker Boys picked up the game really well as they won the competition 6-4 and they all performed exceptionally well. Even without the handicap, they would still have drawn 5-5. Thanks to all who took part and we look forward to the next challenge. 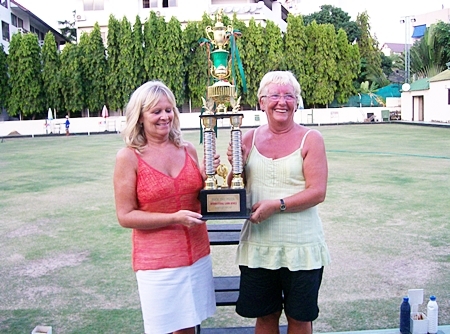 The Bowling Green Bowls Society. The 2 Vals (Grieg & Corner) hoist the trophy on behalf of the Bunkers Boys.